The Lawrence Herbert School of Communication at Hofstra University is making the transition to HD with Hitachi 4K cameras. For those that think 4K is financially out of reach, here’s an interesting case in point: it’s not too expensive for a mid-level college in New York that thinks that it makes sense to buy 4K and shoot in HD today while knowing they’ve future-proofed their inventory for tomorrow. Hofstra University, in Hempstead, New York, has purchased eight Hitachi SK-UHD4000 4K broadcast cameras for its studio and field productions. That’s right, a mid-level college producing local programming in 4K (and distributing in HD). The school bought the high-resolution cameras to support its educational initiatives in broadcast, journalism and more across two departments as The Lawrence Herbert School of Communication finalizes the HD transition of its production studios. Evan Cornog, dean of The Lawrence Herbert School of Communication at Hofstra University, said the ability of the SK-UHD4000 to be used as both a studio and field camera, in multiple resolutions, made it a good fit for Hofstra University. Buying 4K today ensures that the school will have a viable camera for several years to come (shoot HD today, 4K tomorrow). Cornog envisions an “exploratory process” in the early going, with the SK-UHD4000 as the educational cornerstone for learning how to use 4K technology. 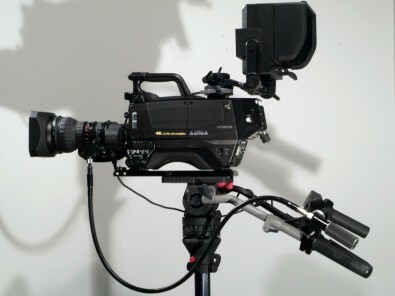 Faculty and students in the Radio/TV/Film and Journalism/Media Studies/Public Relations departments will use the cameras for a variety of curricular and extracurricular productions. Randy Hillebrand, training coordinator and adjunct associate professor of Radio, Television, Film at Hofstra University, envisions the 4K production message as an enticing draw for future students. Coupled with Hofstra’s proximity to the production hotbed of midtown Manhattan, offering a forward-looking technical infrastructure will be attractive to students exploring a career tied to the two departmental curricula. Hillebrand adds that from a technical perspective, the transition from the existing triax cable system to fiber-optic will strengthen interconnection between the building’s master control and production studios, while simplifying ongoing maintenance and providing a more flexible and longer potential life span. It also allows us to expose students to a connectivity technology that is quickly becoming the industry standard. The SK-UHD4000 from Hitachi Kokusai America uses standard 2/3-inch, bayonet-mount lenses and provides the ability to acquire in 4K, 2K and HD.